Our Relationships Are Personal. Living Assistance Franchise Opportunities Are Meaningful. Learn and grow as a business owner with Visiting Angels living assistance franchise opportunities. Choosing among Living Assistance franchise opportunities is as much about the cost of entry and available territories as it is about the support the franchisor is prepared to offer. Our homecare franchise opportunities from Visiting Angels are well-known for the support offered to franchise owners and the commitment by the franchisor to provide a comprehensive plan for success. When you choose Living Assistance franchise opportunities from Visiting Angels, you can take advantage of a variety of support opportunities designed to provide in-depth information and assistance from industry professionals. Our franchisees can take advantage of personalized support offered by our operations team and our annual retreats. Each year our National Conference offers franchise owners the opportunity to gather and learn from each other. 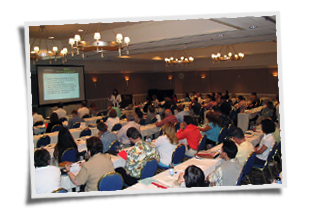 The Visiting Angels National Conferences features top experts in the private duty homecare field who present workshops on a wide variety of topics to our franchisees. We also provide experts in the area of small businesses, human resources, compliance, licensure, and countless other areas to provide knowledge and to answer your questions. The agenda at our National Conference is driven by our extensive experience in the industry and the feedback we receive from our franchise owners. In addition to our three day annual conference, we offer regular "Business Builder" events and/or regional meetings. These meetings are held in various locations throughout the year and are as unique as the relationships they foster. Our regional meetings provide additional opportunities to meet with our Operations team and your fellow franchise owners to share successes and receive guidance on the growth of your location. Visiting Angels living assistance franchise opportunities come with the leadership, marketing and support needed to get you started on a successful career as a franchise owner. Compare our living assistance franchise opportunities to others in the industry and find out why Visiting Angels is preferred by many future business owners. Click the Get Started button now to receive more information on Visiting Angels living assistance franchise opportunities.